Amherst College (i/ËˆÃ¦mÉ™rst/ AM-É™rst) is a private liberal arts college located in Amherst, Massachusetts, United States. Founded in 1821 as an attempt to relocate Williams College by its president, Zephaniah Swift Moore, Amherst is the third oldest institution of higher education in Massachusetts. The institution was named after the town, which in turn had been named after Lord Jeffery Amherst. Amherst was established as a men's college and became coeducational in 1975. Amherst is an exclusively undergraduate four-year institution and enrolled 1,795 students in the fall of 2015. Students choose courses from 38 major programs in an open curriculum. Students are not required to study a core curriculum or fulfill any distribution requirements and may even design their own unique interdisciplinary major. Freshmen may take advanced courses, and seniors may take introductory ones. For the class of 2020, Amherst received 8,397 applications and accepted 1,149 yielding a 13.7% acceptance rate. Amherst was ranked as the second best liberal arts college in the country by U.S. News & World Report, and ninth out of all U.S. colleges and universities by Forbes in their 2015 rankings. Amherst competes in the New England Small College Athletic Conference. 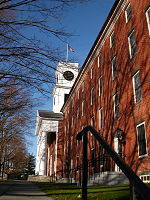 Amherst has historically had close relationships and rivalries with Williams College and Wesleyan University which form the Little Three colleges. The college is a member of the Five Colleges consortium, which allows its students to attend classes at four other Pioneer Valley institutions. These include Mount Holyoke College, Smith College, Hampshire College, and the University of Massachusetts Amherst. Founded in 1821, Amherst College developed out of the secondary school Amherst Academy. The college was originally suggested as an alternative to Williams College, which was struggling to stay open. Although Williams remained open, Amherst was formed and diverged from its Williams roots into an individual institution. 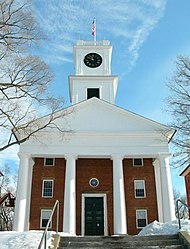 In 1812, funds were raised in Amherst for a secondary school, Amherst Academy; it opened December 1814. The institution was named after the town, which in turn had been named after Jeffery, Lord Amherst, a veteran from the Seven Years' War and later commanding general of the British forces in North America. On November 18, 1817, a project was adopted at the Academy to raise funds for the free instruction of "indigent young men of promising talents and hopeful piety, who shall manifest a desire to obtain a liberal education with a sole view to the Christian ministry." This required a substantial investment from benefactors. During the fundraising for the project, it became clear that without larger designs, it would be impossible to raise sufficient funds. This led the committee overseeing the project to conclude that a new institution should be created. On August 18, 1818, the Amherst Academy board of trustees accepted this conclusion and began building a new college. What are the academic rankings for Amherst College? 1. number 86 for Academics. 2. number 158 for ROI (Return on Investment). What universities are similar to Amherst College?